Implementation of Industry 4.0 and IoT concepts comes with a wide range of requirements, particularly for machine diagnostics, including online and offline condition analysis, predictive maintenance, pattern recognition, machine optimisation or long-term data archival. As a result, seamless and cycle-synchronous data acquisition becomes a pre­requisite for effective analysis and correction of processing errors in the machine. 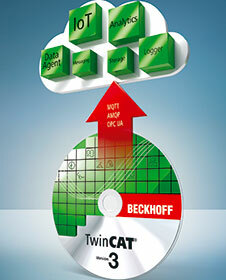 For this reason, Beckhoff has developed the TwinCAT Analytics tool to serve the growing needs of Industry 4.0 applications. Processing errors in machines generally create excessive cost and lost production time. The situation becomes all the more serious if there is a lack of machine data and production parameters for analysing processing errors and avoiding such errors in the future. The new TwinCAT Analytics tool can be used to rectify this information deficit by storing all process-relevant data in a cycle-synchronous manner. Data is stored in a standardised process data format with data compression, either locally in the controller, in a cloud-based solution on a server in the company network, or in a Public Cloud, as required. TwinCAT Analytics provides a complete temporal image of the process and the production data. This offers an ideal information baseline, not only to assist in the event of an error, but also to enable comprehensive condition analysis of the machine, among other functions. The recorded process and production data can be analysed online or offline, and machine cycles can be examined for minimum, maximum and average values of the cycle times. Total runtimes and time differences of production processes can be gleaned from cycle counters or offline trace analyses, e.g. via “post-scope configuration” in TwinCAT Scope View Professional. Further benefits arise for predictive maintenance. Logging of data from operating hour counters, frequency analysis or RMS calculations, for example, enables implementation of high-performance condition monitoring. Moreover, the system facilitates limit value monitoring for different process data. Pattern recognition for detecting regularities and repetitions in the recorded data further improves the reliability of the process sequence. In addition to optimum support for error analysis, TwinCAT Analytics offers numerous opportunities to further machine optimisation. The status analysis provides all the information required for optimising the machine or system in terms of energy consumption or process sequence. In addition, detailed knowledge of all processes simplifies the drive configuration and it may be possible to reduce the connected load of machines based on sound measurement readings. This tool serves an increasing demand for highly flexible production down to batch size 1. In this case, TwinCAT Analytics can provide comprehensive production documentation for each individual workpiece. • The TwinCAT Analytics logger enables cyclic storage of large data quantities, storing the entire process image, including the application data (e.g. from the PLC or NC), following the essence of ‘Big Data’ concepts. • The TwinCAT Analytics workbench serves as an engineering tool for online and offline analyses of one or more machines. It includes the PLC runtime, the new analytics configurator, the TwinCAT Analytics PLC library, a Scope View Professional licence, and interfaces with TwinCAT IoT for communication via the standardised MQTT protocol. • As a PLC library for application in the analytics workbench, the TwinCAT Analytics library contains numerous function blocks, enabling benefits such as cycle analysis, energy demand or RMS calculations, among others. • TwinCAT Analytics cloud storage can house data and make it available in private or public networks via a “message broker”. Automated post-print processing puts the finishing touches on 3D printed parts.